Jamie Kuli McIntosh is a collector and organizer of all things. She is forever seeking new ways to transform the mundane into something interesting, useful, and beautiful. In fact, she would proudly wear a badge labeling her a Pack-Rat or an Art-Engineer. Currently, Jamie has become absorbed in the history and methods of quilting, and is exploring and challenging the definition of “garbage” with her artwork. 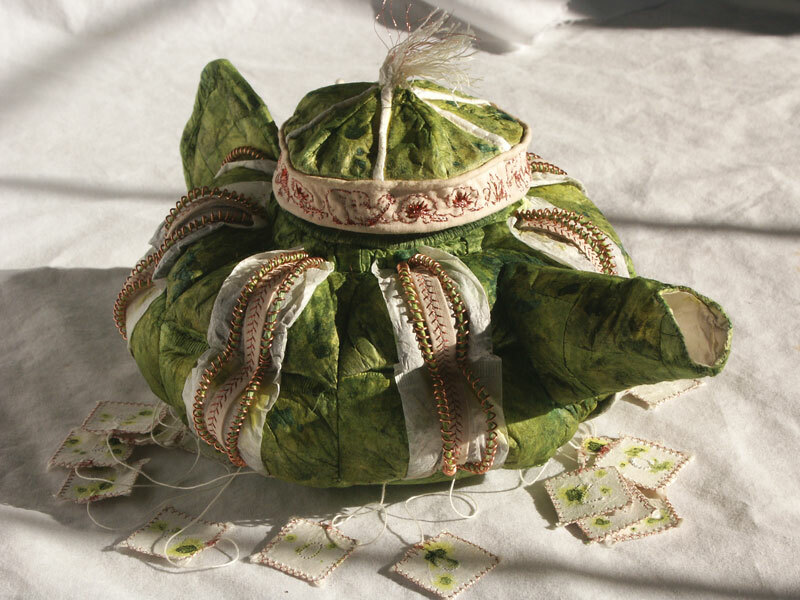 While it is true that she defines herself as a textile and fiber artist, she finds herself trying to coin a term that means “anything that you can attach to something else using a sewing machine”…this is because she does not limit herself to using only fabric and cloth, and has also been known to sew with plastics and paper. She graduated from Transylvania University in Lexington, Ky, and now resides in Georgetown, where she has taken over the garage and turned it into her studio. It’s sometimes challenging to make a really great piece of art that is realistically functional without having to “dumb it down” a bit. If you’ve ever tried to make a teapot out of fabric, then you know what I mean. You’ve never tried that? Well, if you say so. That being said, it’s often a complicated process to create something absolutely original without being sucked into using typical, tried-and-true materials. As far as fine art goes, that’s what I’m working on conquering right now. I find it difficult to explain the way I work; the process isn’t always the same. But mainly, I start with a collection of one specific material (otherwise known as “a pile of junk”). Usually by the time I have accumulated a great heaping mass of this said material, I have figured out an interesting way to attach all of them together, united with a new and different purpose. For example, candy wrappers, fabric softener sheets, buttons, pistachio shells, scraps of foil and copper, clothing tags, and pressed leaves are all excellent things for me to collect and work with. By re-using discarded materials, I don’t mean to explicitly make a political statement about recycling–but I am interested in questioning humanity’s social expectations and transforming the mundane into something interesting and useful. Since I have recently re-discovered my passion for sewing, anything that can be sewn together is definitely of interest to me (no matter how silly or disgusting). Also, I’ve recently been working on creating a unique line of clothing that makes underwear something you’ll want to wear on the outside.